BRUSSELS (AP) -- The rain has washed away the defiant chalk slogans from the square in front of Brussels' stock exchange, the barriers are gone from many subway stations and trams are back running in the streets. Europe's capital returned to work Wednesday but it isn't business as usual. A platoon of soldiers is now standing guard outside the city's central train station. There's only a trickle of tourists flowing through Brussels' gothic Grand Place and gardeners at Brussels' 18th-century Warandepark are checking each trash can extra carefully. Defiance and fear mingled in residents' minds, as the city came to terms with the violence that they had long expected but had hoped wouldn't come. Jean and Anne-Marie Materielle were one of only two dozen or so tourists admiring the gilded gothic facades of Brussels' Grand Place. The pair from central France arrived from Brussels on Tuesday, arriving in the Molenbeek neighborhood only hours after the three bombs went off in the Brussels airport and subway. Both said they'd gotten an earful from a local businessman who was devastated that his neighborhood _ a favored locale for several of those who attacked Paris on Nov. 13 _ was once again at the center of world attention. ``He wasn't happy,'' Jean said. A line swelled outside the central train station in Brussels as travelers queued to get their bags checked. Soldiers stood guard every few feet as half a dozen military trucks idled nearby. The mood on the street was jittery. Several metro stations were still closed, roads were snarled with traffic. Sirens repeatedly wailed. Joggers ran loops and dog walkers chatted in Brussels' Warandepark, across from the country's parliament. But the gardeners on duty said the atmosphere was different. ``And you can hear the sirens,'' he added as an emergency vehicle blared its way down the road. Thousands of Belgians and others came to a downtown square in an impromptu vigil Tuesday night, drawing messages of love and defiance in chalk on the pavement amid fluttering candles. 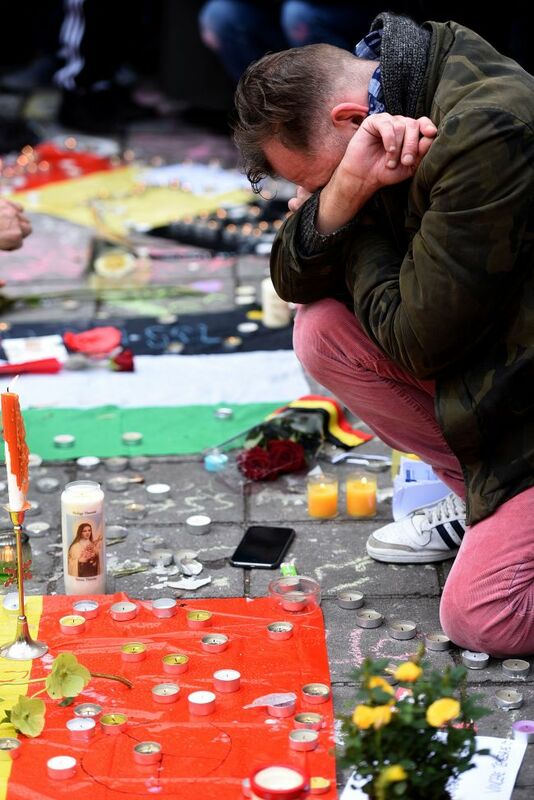 Loic Wiard stood silently at the vigil, his arms crossed as the Belgian national anthem played off his smartphone and a Belgian flag draped across his square shoulders. Wiard, a 29-year-old bus driver from outside the city, said he came to show solidarity and highlight the country's unity. And while he said he didn't wish war on anyone, he didn't seem to have much time for the peace-loving messages spread across the pavement. He said Europe had to get serious about the threat of Islamic extremism. ``If we don't fight them hit them hard over there, they'll come hit us over here,'' Wiard said.